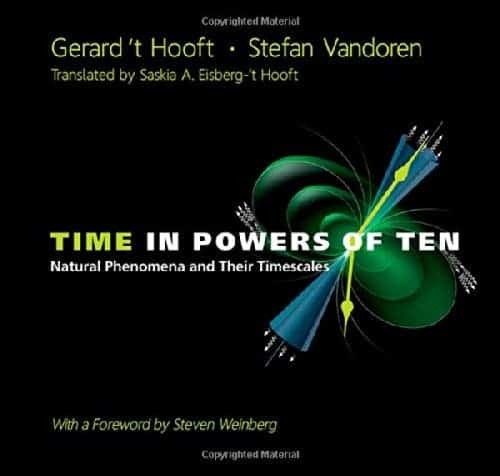 Time in Powers of Ten is one of those books suitable for everyone – from teenagers to accomplished scientists. There’s something to learn for everyone, and even if you somehow know everything that’s in the book, the text is so pleasant and the illustrations are so rich and well suited that you’ll definitely enjoying reading through it. The book invites us to take a walk through time – leaping across powers of ten. It starts with a second, and describes what phenomena take place at that time scale. It them grows the time frame more and more, It passes through years, centuries, slowly moving towards geological periods and even astronomical periods, ultimately reaching a period longer than the age of the universe – something which barely has any meaning at all. But the book isn’t about time, it’s about what happens during time. We get to see who invented time measuring devices, what the Earth looked like millions of years ago, how stars are born, how the universe was born, and how come we know all this. It presents things from many different fields, from biology and history to geology and astronomy, the text is varied, informative, and easy to read through. The pictures are really great as well. After you get to the biggest conceivable time frames, the book does a 180 – it goes straight back to the smallest time frame – the Plank time. The transition is actually surprisingly smooth, because astronomical processes are tightly connected to quantum mechanics and sub-atomic particles. The time period grows and grows, until, after several powers of ten, it reaches the second again. I assume the biggest challenge of the book was how to decide what phenomena and processes to include – because naturally, you can’t talk about everything that happens. I have to say, the choice was quite inspired; it was varied enough to avoid boredom and unilateralism, and coherent enough to be easy to read through. All in all, I really like the concept of this book, and I enjoyed reading it. I actually read the entire book in one go, which rarely happens to me. I wouldn’t say it’s a must have, but it’s definitely a welcome addition to any library, no matter who you are and where you’re from.